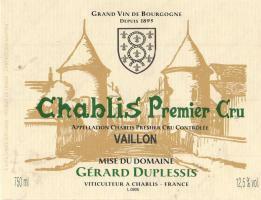 The Wine and Cheese Place: Duplessis Chablis is back in stock! Lowest price on Wine-Searcher is $44.99The 2014 Chablis 1Er Cru Vaillons, which spent six of 18 months in used 450-liter oak barrel (just 10% new), has a very expressive bouquet with a pleasant and well-judged reductive note that does not obfuscate the terroir expression. The palate is medium-bodied with fresh acidity, a lovely saline component with a linear, quite stern and compelling finish. It is a little tight at the moment, but I can see this repaying 2-3 years in bottle. One to watch. $20 cheaper than the next closest competitor! The 2013 Chablis Grand Cru les Clos, which comes from a single parcel of vines planted in 1964, has a fragrant bouquet: hints of dried honey intermingling with orange rind at first, segueing into more traditional mineral/granitic aromas. It's quite mercurial as I observed it over five minutes. The palate is well balanced, similar in style to the Fourchaume '13 in some ways with touches of orange rind and even dried mango toward the finish that then merges into quite a lively, spicy, ginger-tinged aftertaste that loiters for 45 seconds. Give this a couple of years in bottle then enjoy this Les Clos over the following decade.